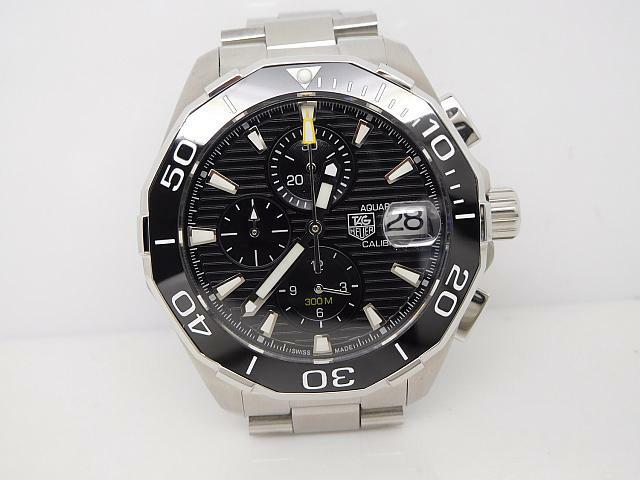 It has been out of stock, now the replica Tag Heuer Aquaracer is available again. This time, BP factory published another great replica, there are three versions, black, white and blue. 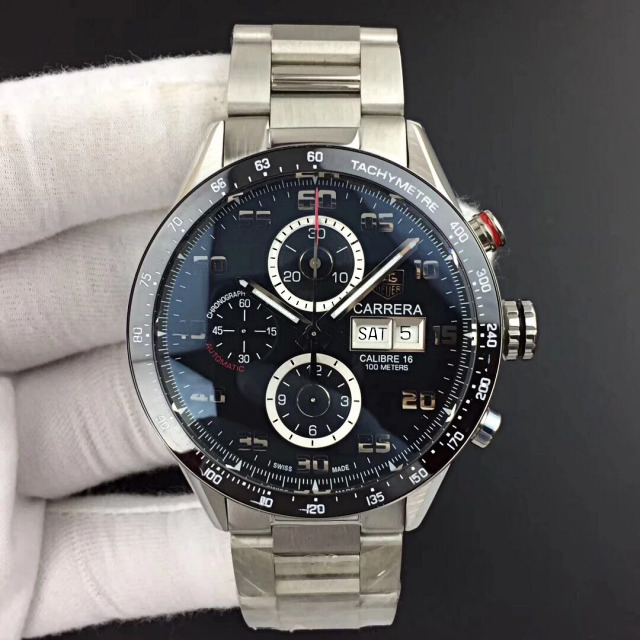 It is a high quality replica but sold at a very low price because the replica is equipped with a Japanese quartz movement. 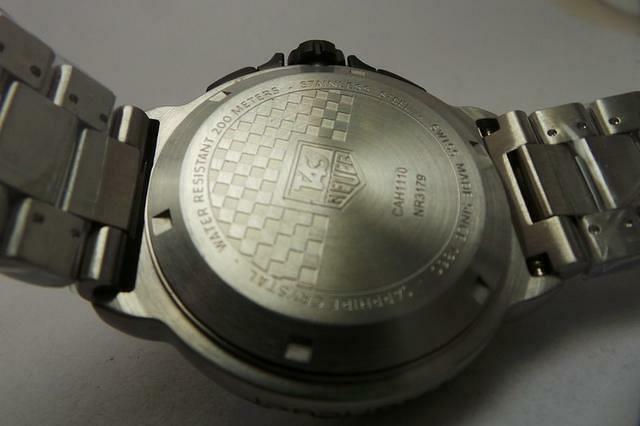 The watch uses a very common case shape, you can see such type of case in every Swiss brand watch. 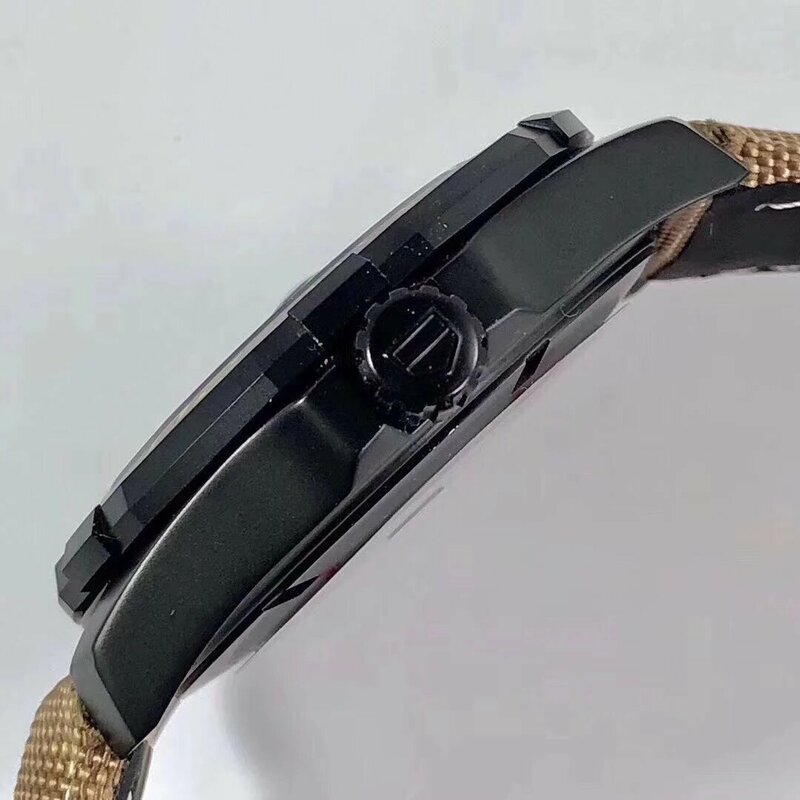 It is at a cost-efficient price but does not mean the watch is low quality, there are several places that could add points to the replica. I will introdue each big selling point to you in the following article. 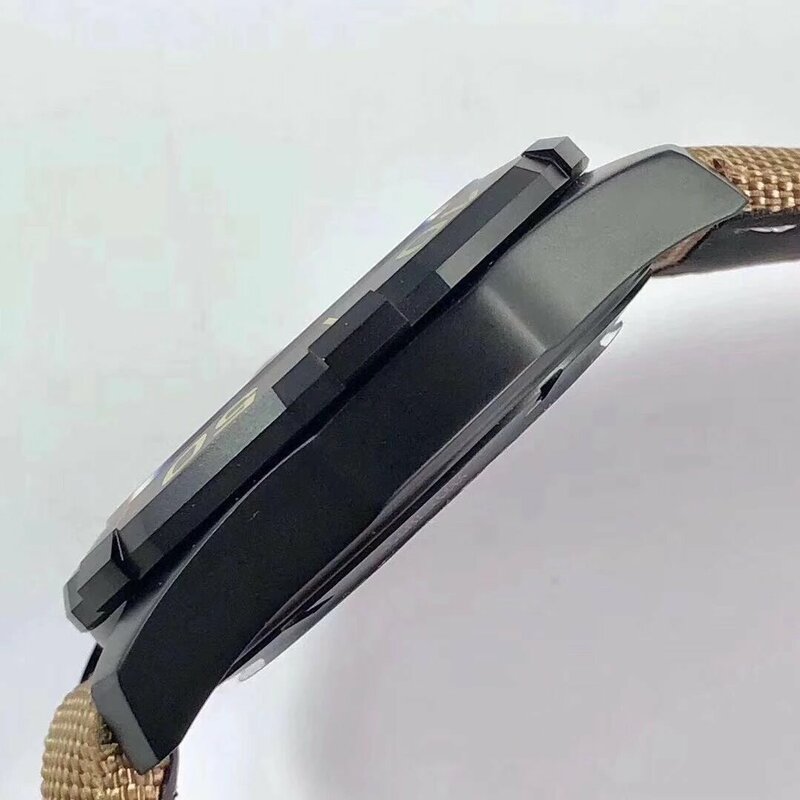 The replica is sold at only $238 usd but it is fully made of 316L stainless steel, brushed steel case and bracelet let you really feel its high quality texture, the weight is also considerable and very similar to genuine. Black, white or blue bezel uses real ceramic, on the black watch, there are white bezel engraveings and a luminous pearl at 12 o’clock. 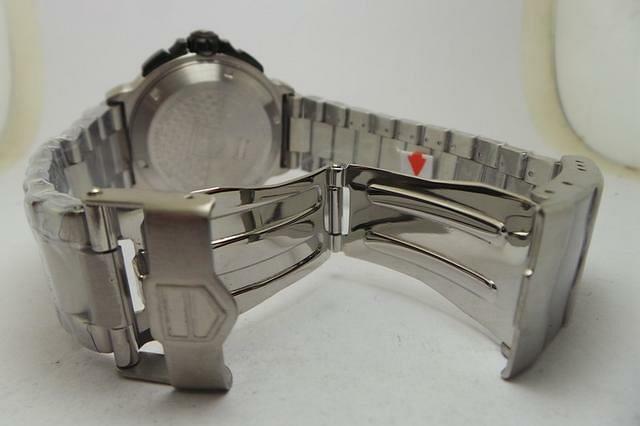 The bezel has several clutches for the wearer to rotate easily, especially their hands are wet. 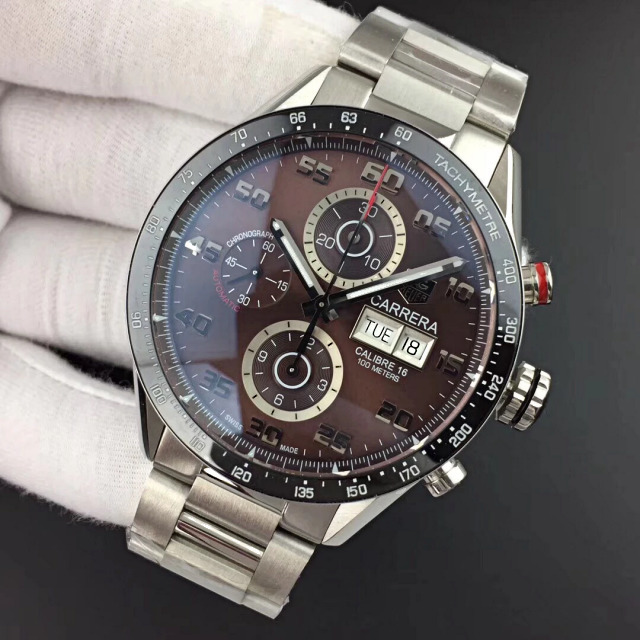 Black dial has stripes, three subdials use sunken design, it gives a perfect visual effect, small second hand is running on the subdial at 3-6-9-12 counter, the top subdial at 12 is for 30-minute chronograph. All trapezoidal hour markers have silver edge and filled with white luminescence. 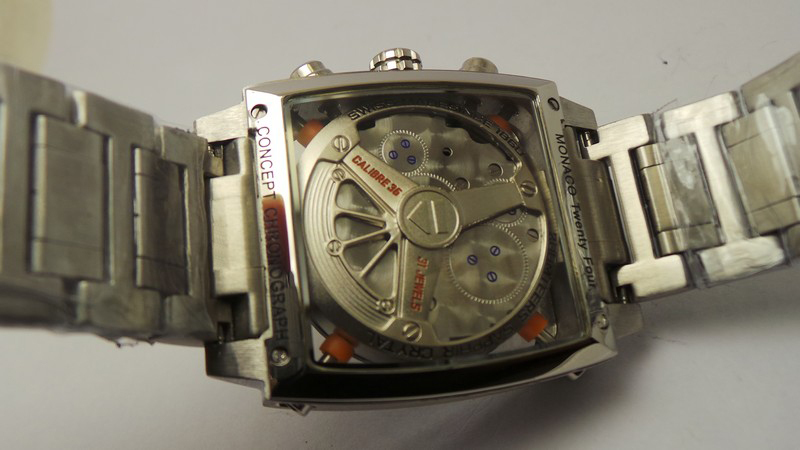 Central slender hand with orange tip is for seconds chronograph. 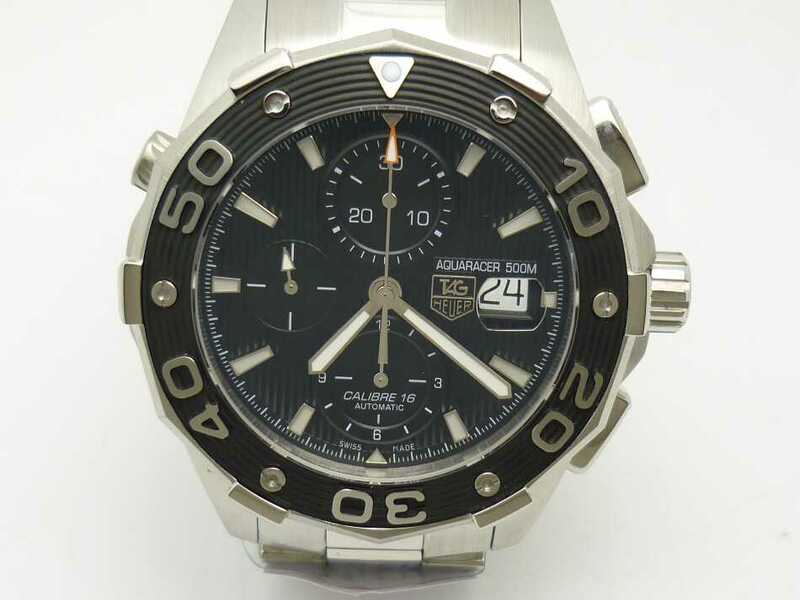 You can read a lot of information from the dial, like it is a replica of Tag Heuer Aquaracer 300M. 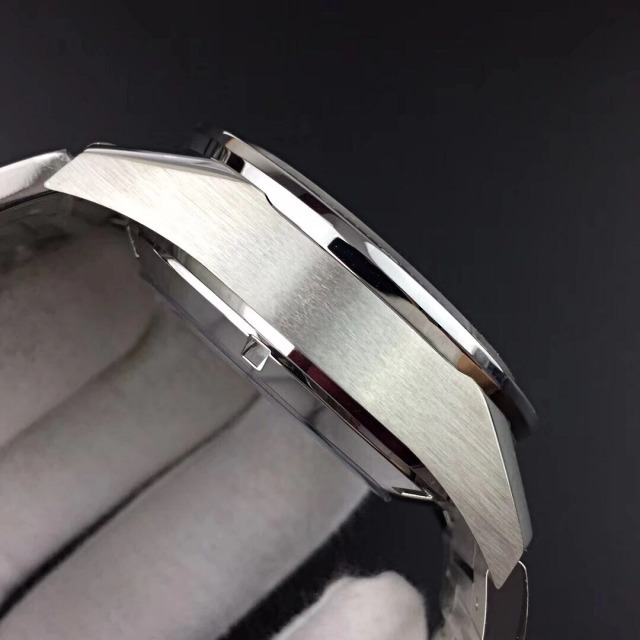 Compared with genuine, there is only a little difference on dial, other watch parts are perfect and could be said 99% close to genuine. Especially engravings on case back and buckle, they are very delicate, the engraving has a certain depth and uses sandblasted finishing, which makes the replica feels very real. 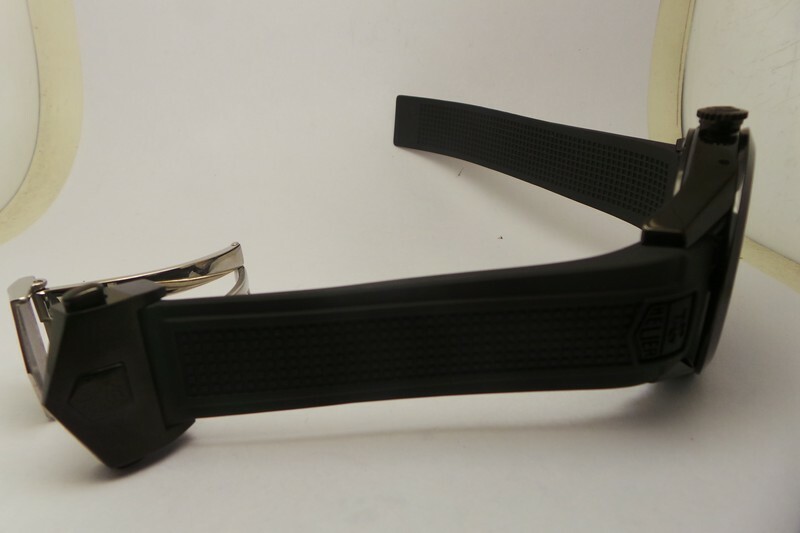 The fasten construction of the clasp is very realiable. 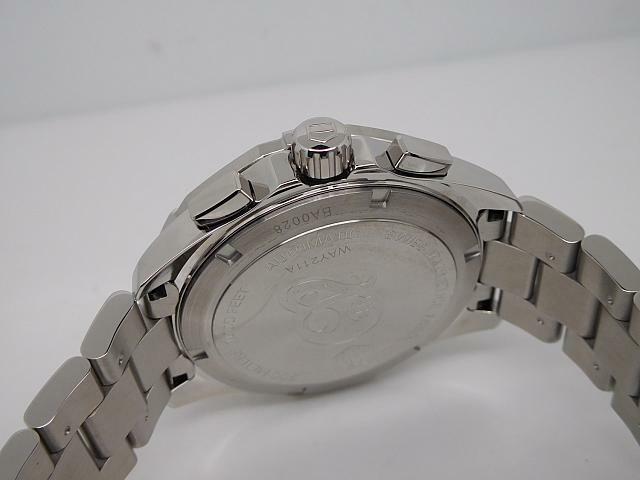 In a word, for a quartz watch, no replicas like this one have such a high quality. 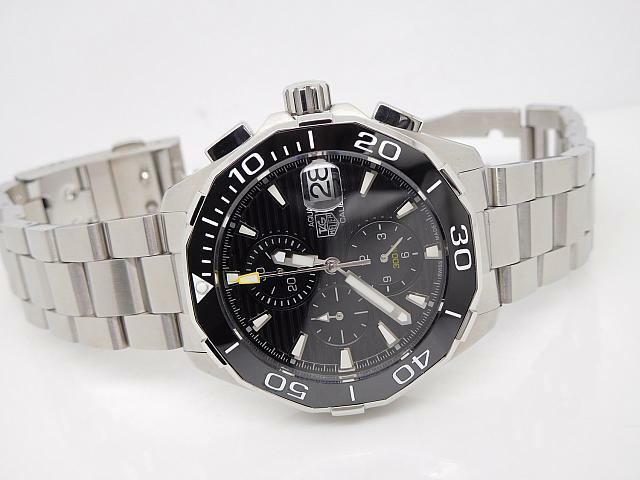 Tag Heuer Formula 1 is a great watch specially made for Formula 1 racing. 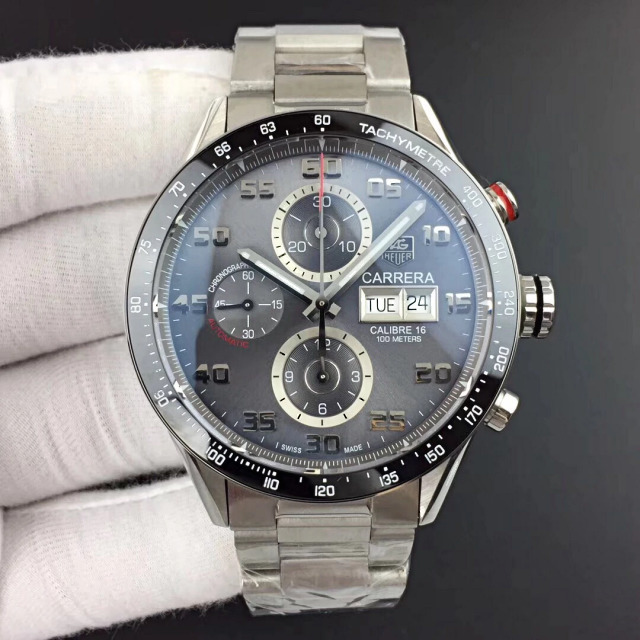 Due to outstanding second-chronograph performance Tag Heuer has made, they have built a tight association with Formula 1 racing for a long time, chronograph watches are very expensive, especially the one made for particular racing sports. 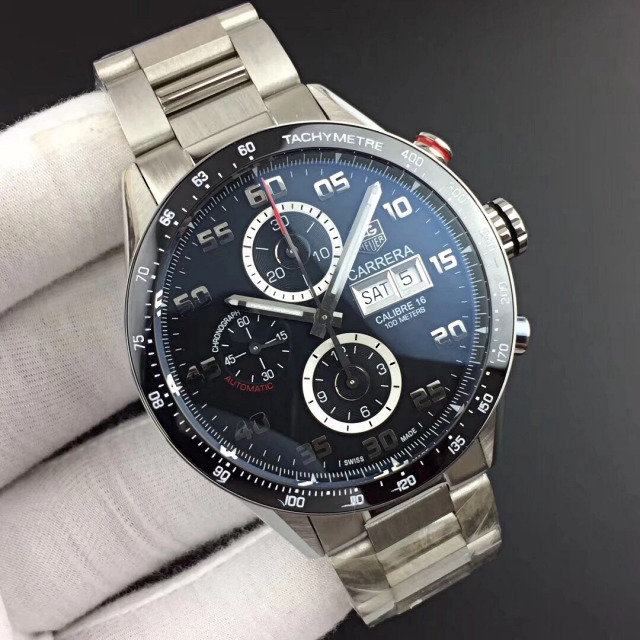 So, our factory offers you guys a chance to get a good Tag Heuer Formula 1 watch at the lowest price in the market, although it is a replica, the watch will function the same as genuine, here I will give a short review of this watch. It is the case that makes me feel the watch is so special. 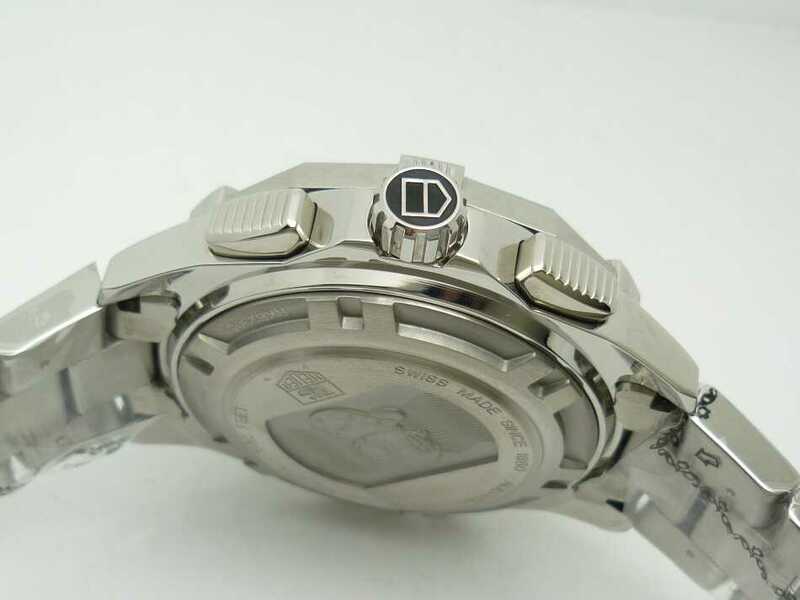 See the bezel, I can not find a word to describe, it is so strange and looks like the bezel of most diving watches. Besides, the bezel is somewhat the shape of racing cars’ tire. 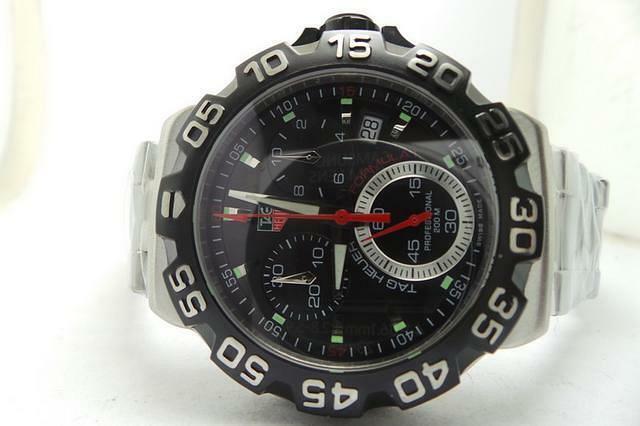 It is full of numeral markers from 05 to 55 in stainless steel. 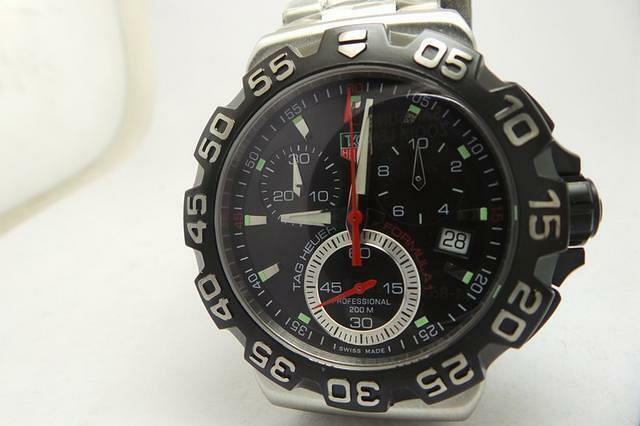 The dial is black, small dial at 6 o’clock features a silver circle with a red small hand. 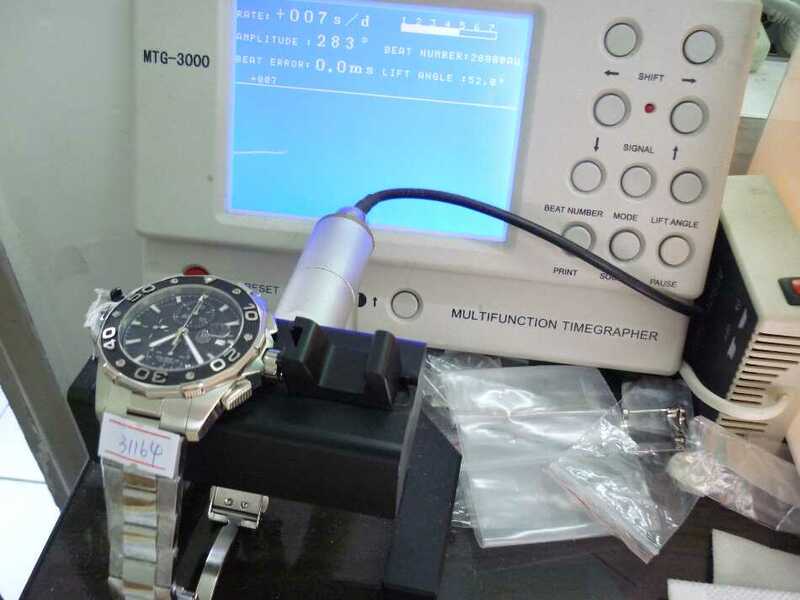 1/10th Second is running on the subdial at 2 while 30-minute chronograph counter is at 10:00. Red “FORMULA1” word on the upper right of the subdial is very obvious and matching the red hands on the dial. Hour markers are stainless steel studs with square cyan markers next to them. 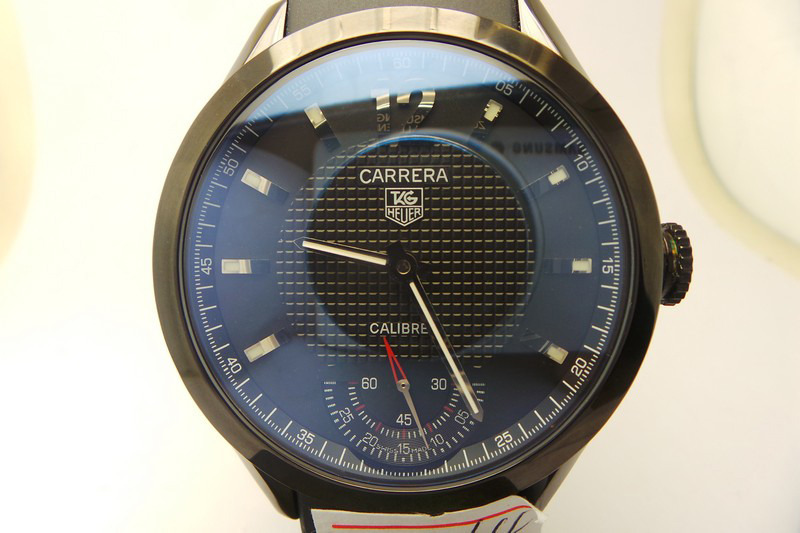 Overall, the dial has a compact layout design but is full of technology sense. It is like a dashboard of the racing car. 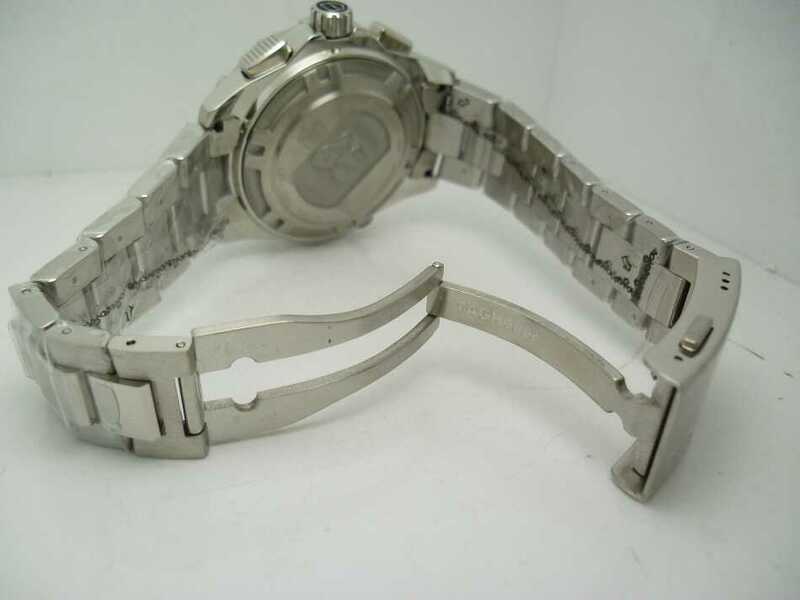 Like the robust bezel, stainless steel bracelet is also strong with solid links. The buckle has a big Tag Logo engraved. 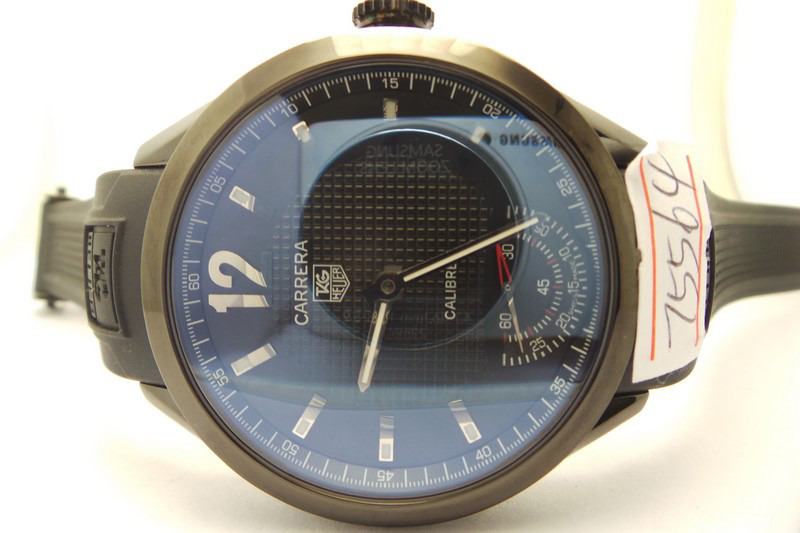 The movement inside is a Swiss ETA quartz, which is directly imported from Switzerland. 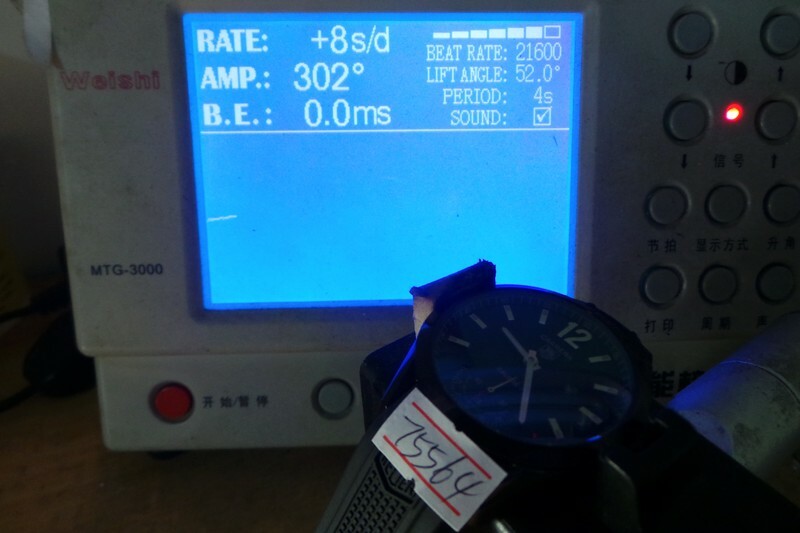 So it will be better and runs longer than other quartz replicas watches. 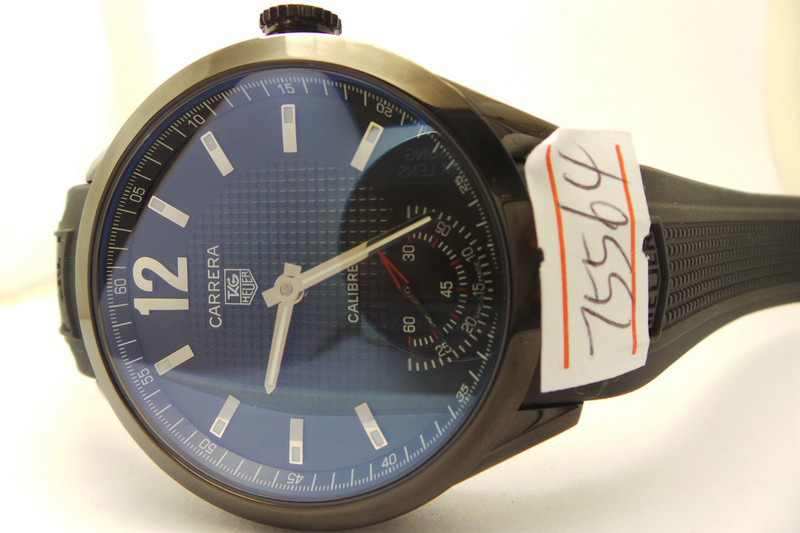 Finally, let’s see the functions of the replica Tag Heuer Formula 1. Hours, minutes and samll seconds, the date is displayed at 3:30 and adjusted through crown. You can push the button at 2 to start and stop chronograph function, if you want the second-chronograph hand back to zero, please push down the button at 4. 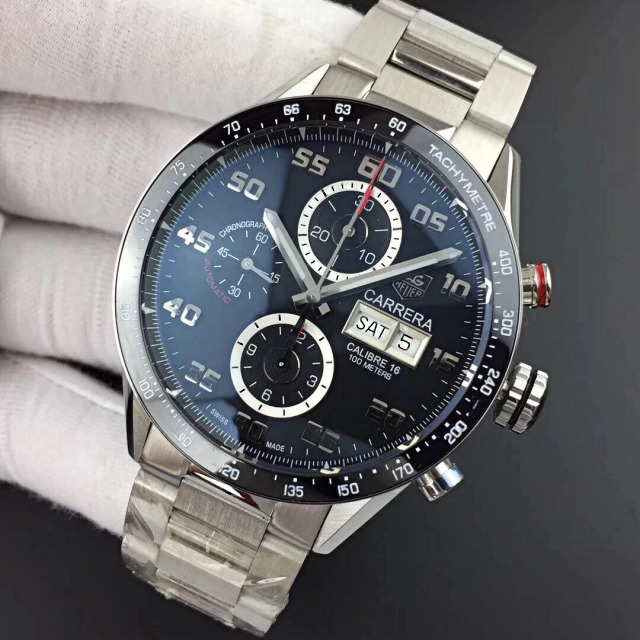 This watch is a superior replica in high quality, you could rarely find a good quartz watch with full solid steel bracelet and runs chronograph function like genuine, so, at $208 usd, you really get a treasure. 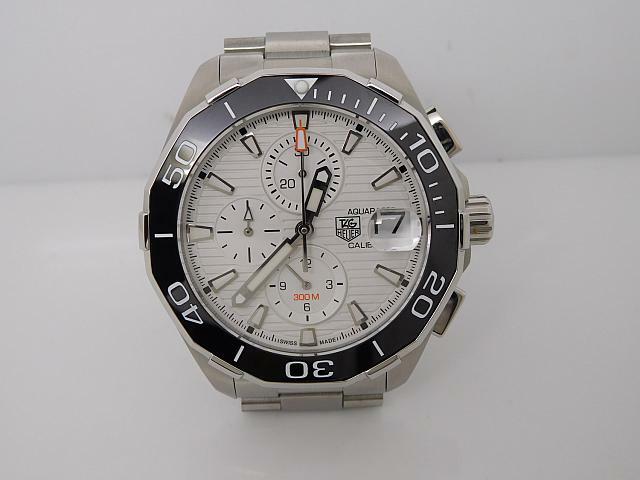 Tag Heuer is one of the best-selling sports watches among all Swiss brands. 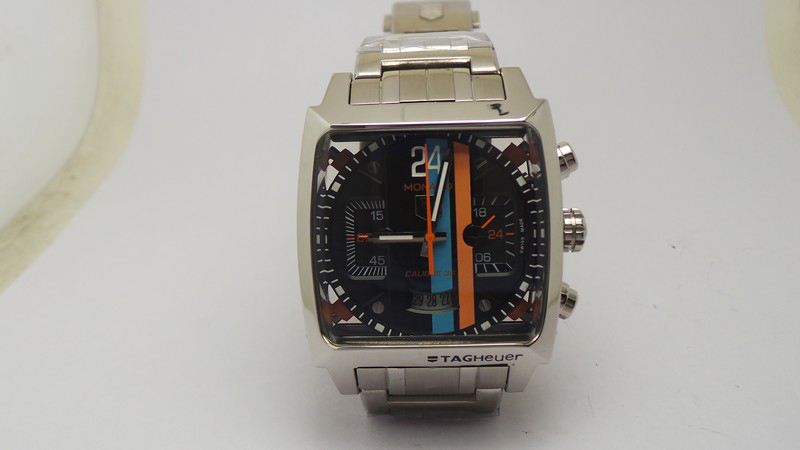 The Monaco Concept 24 is the limited edition Tag Heuer published and the watch created many world first records in watch industry. 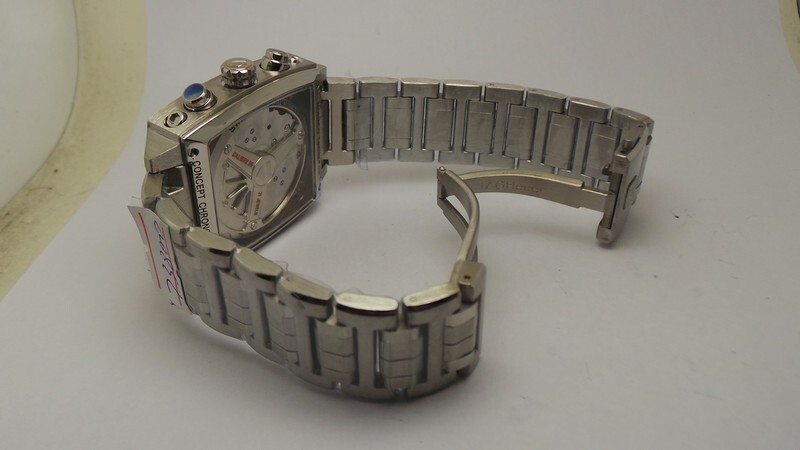 Square shape adds a little vintage favor to this sports Tag Heuer Monaco watch. 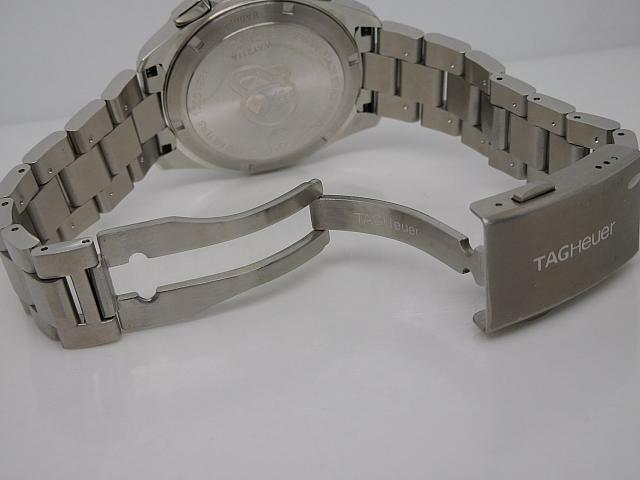 The replica Tag Heuer Monaco Concept 24 is made of full stainless steel, the case has polishing and brushing craft, it is engraved with TAGHEUER, the polishing craftmanship has reached a high level in replica watch industry. 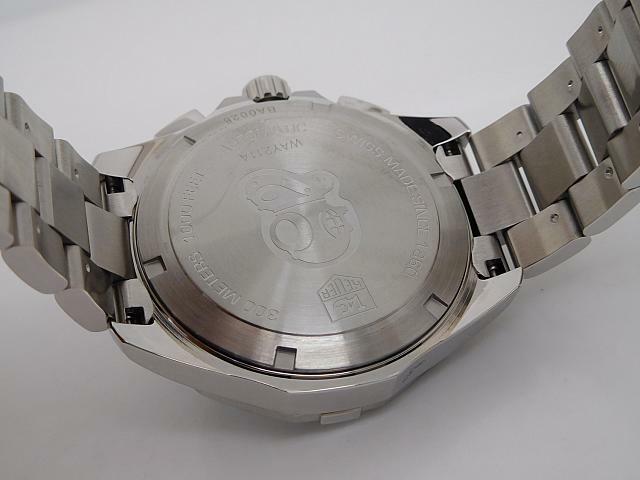 The case has obvious edge and corner, which completely reflects the great progress which replica watch has achieved in recent years. 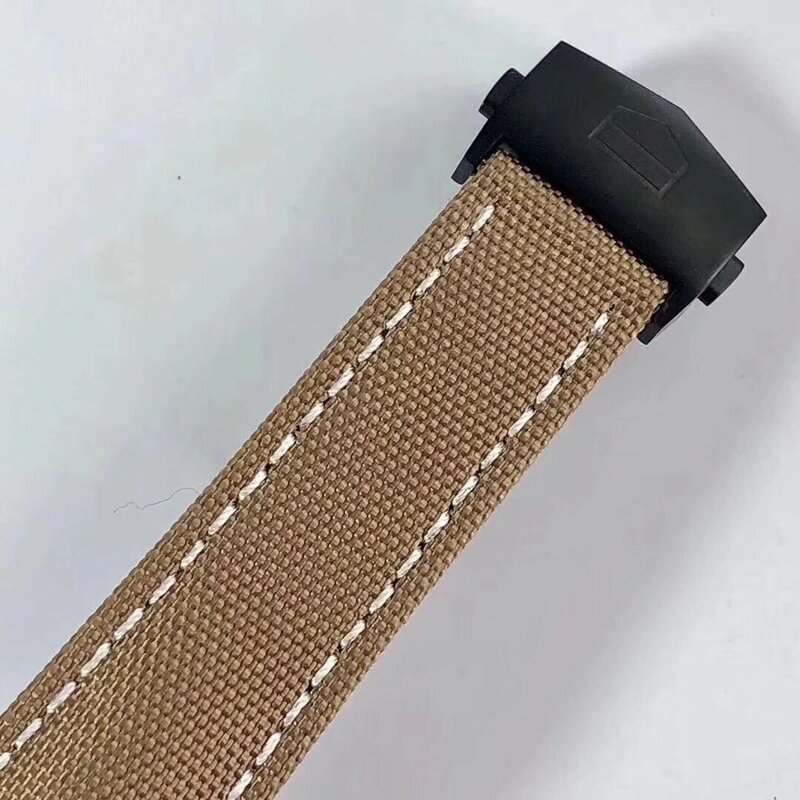 The bracelet is also made of solid stainless steel, which consists of six links, there are two section of links in the middle that are polished, check carefully, the outer edge of the links are polished, so this will not scratch your wrist when wearing. 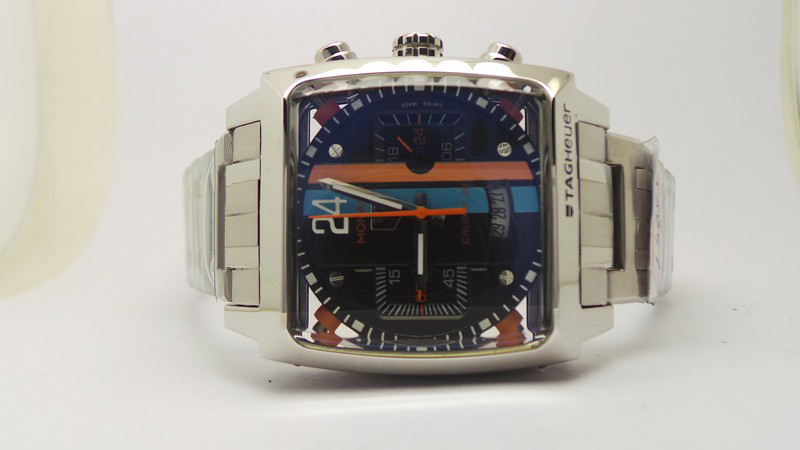 The dial is black, it has blue and orange stripes that are the iconic features of this replica Tag Heuer Monaco 24 watch. 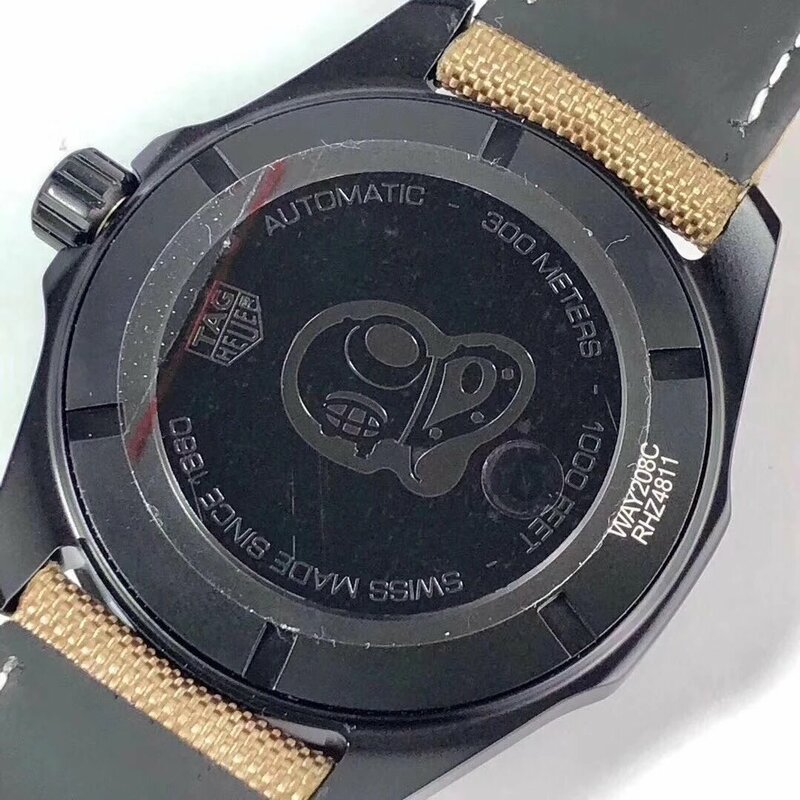 There are some things needed to be explained here about the dial, the metal shield TAG HEUER logo is under the big 24 numeral. The subdial at 3 is indicating 24 hours while the subdial at 3 is running for minute-chronograph counter. Arched date window is polished at 6 o’clock. When you press the button at 2, the chronograph function starts and will stop if you press it again. The button at 4 is a chronograph reset button. 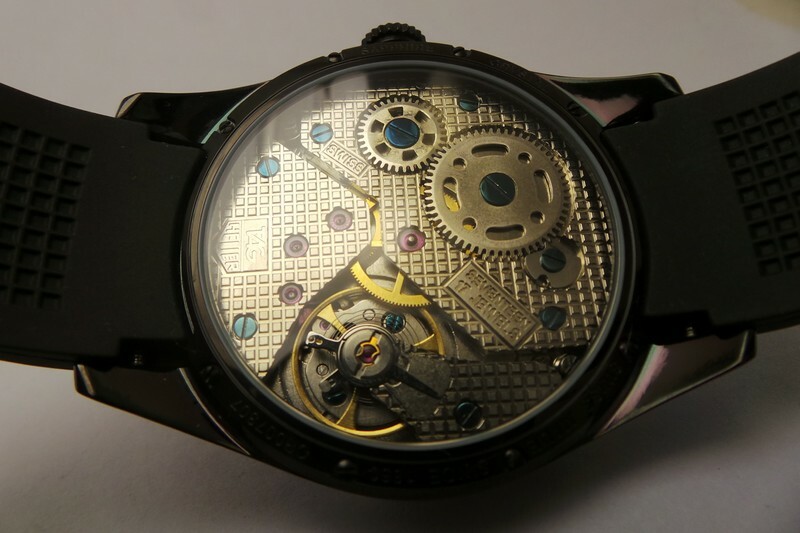 See the crystal case back, you can find a movement inside with unique decorated rotor that has orange lettering. 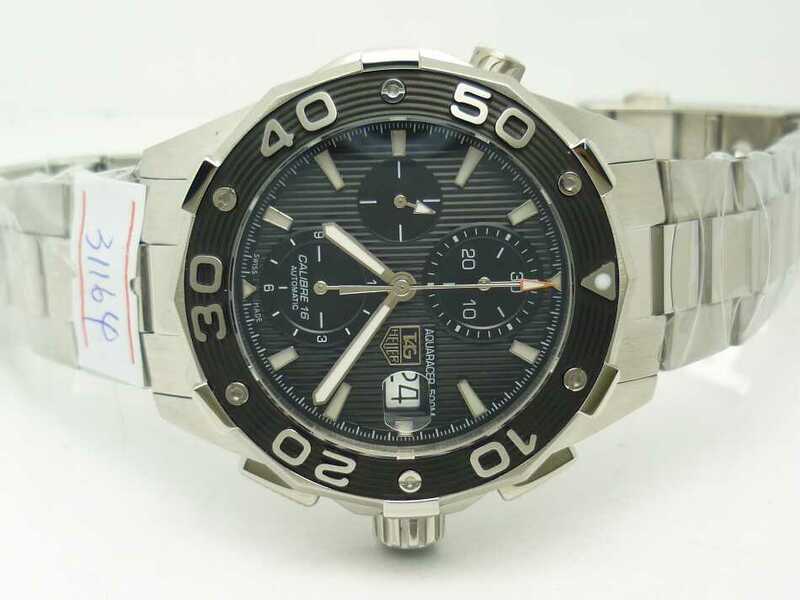 It is a quality Japanese quartz movement equipped in this replica Tag Heuer watch. 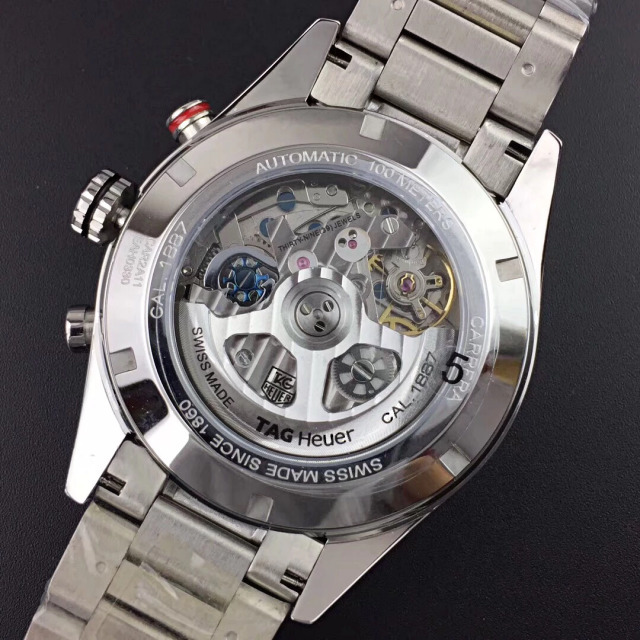 The quartz movement guarantees timing accuracy and high stability of chronograph function. 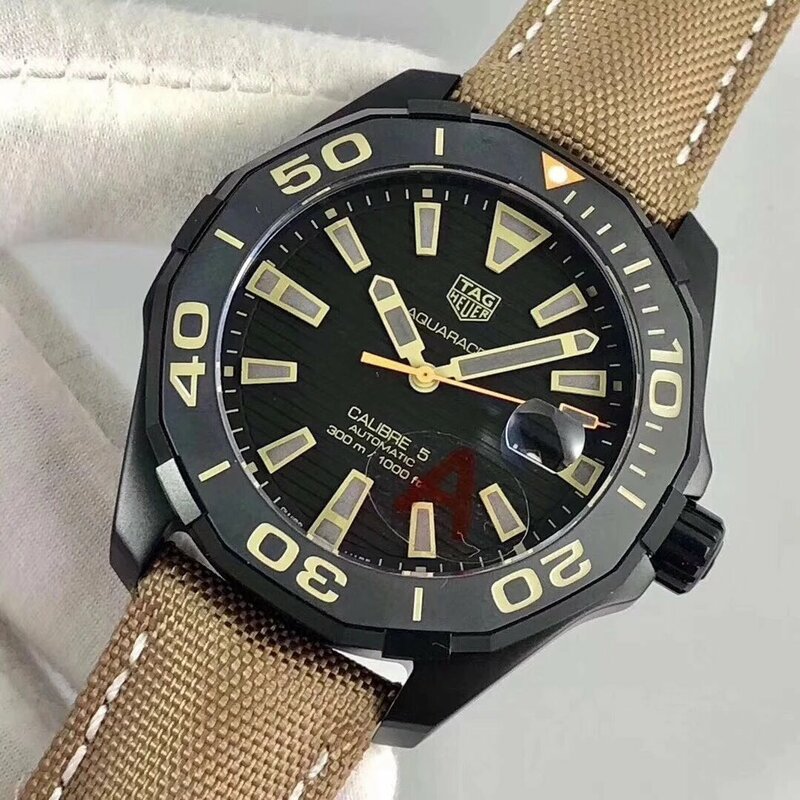 It is the best selling Tag Heuer replica sold in the market, Tag Heuer Aquaracer 500m replica has always been in pursuit by customers, this one is the full stainless steel model, it has no big difference when compared with genuine Tag. 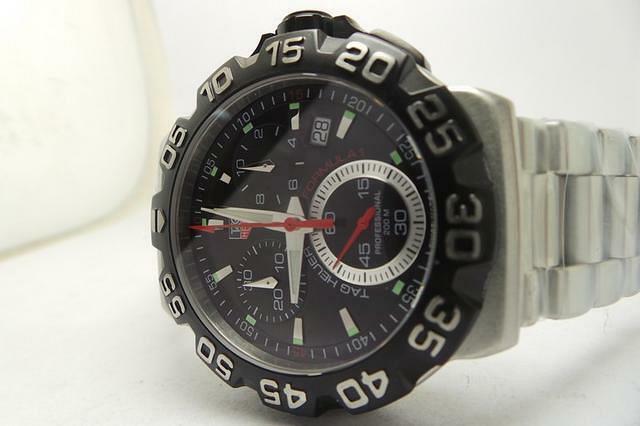 The most attractive places are diving bezel markers that give people a strong sense of three-dimensional, and the updated superlume that emits powerful green light in dark place. 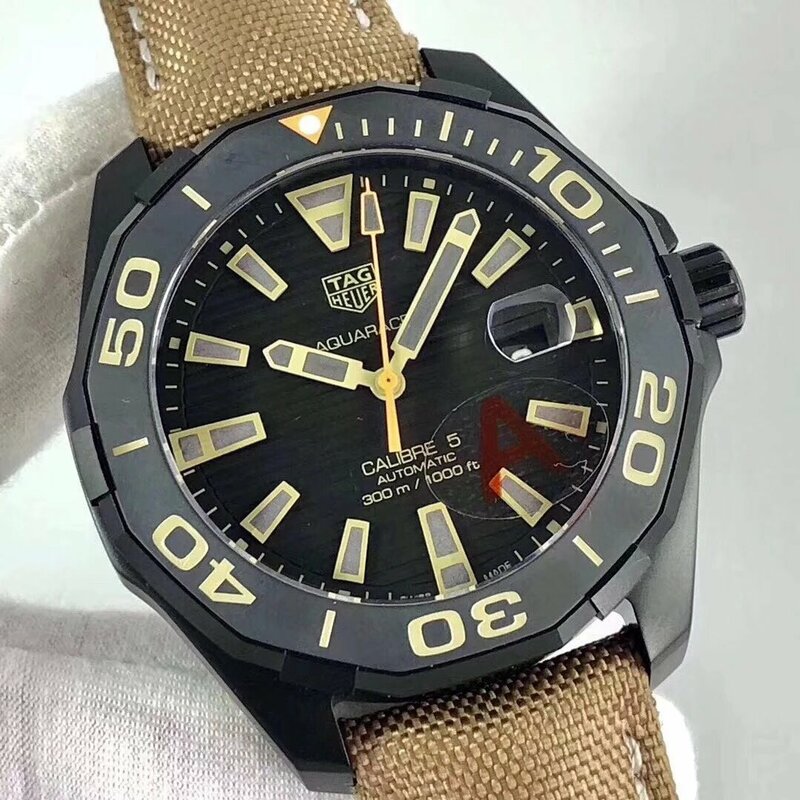 The case is 44.5mm in diameter, it is replicated against the genuine, the bezel has Arabic numeral markers and studs, they are three-dimensional, the uni-directional roating diving bezel has one pearl marker, it also emits green light at night. 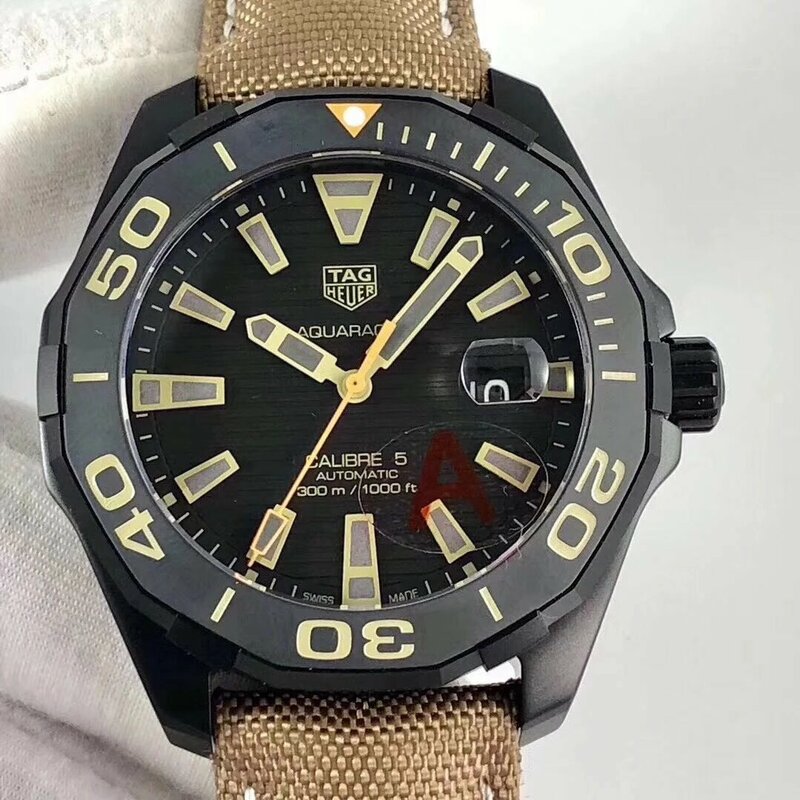 The Secs@9 Asian 7750 movement is more stable and durable, if you want a diving-style replica watch with less money, the replica Tag Heuer Aquaracer will be an entry-level model. 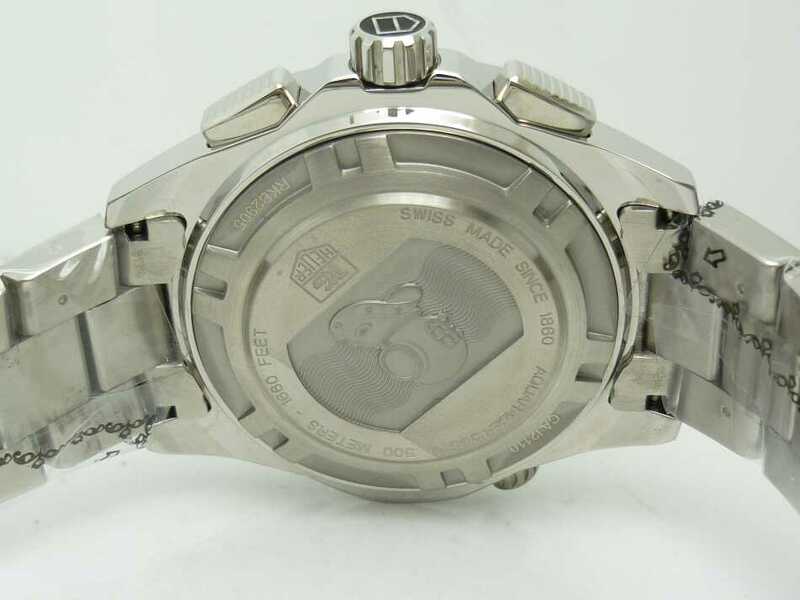 The case is made of one piece stainless steel metal, the whole forged one-piece case construction has the same structure as genuine, crown has Tag shield logo engraved, the case back has perfect engravings and Tag Heuer logo, accurate like genuine, deployant clasp is made of solid stainless steel, with TAG HEUER engraving, the perfect polished lines on clasp, the bracelet will fit your wrist appropriately. 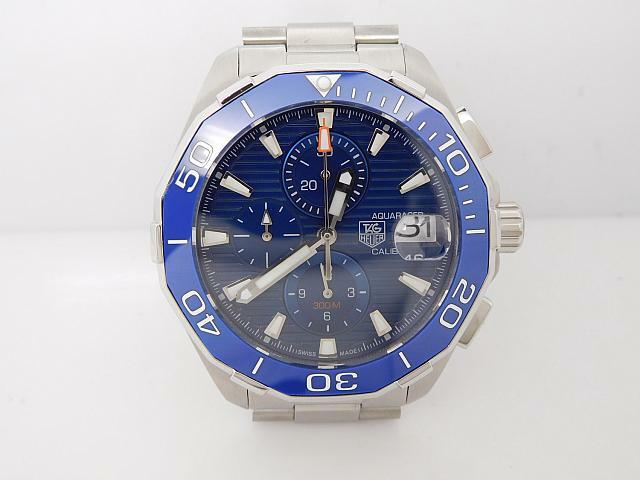 About the function of this replica Tag Heuer Aquaracer 500m watch, it can be clearly gotten on the dial, small second hand is running on the subdial at 9, the minute-chronograph counter is at 12 and hour-chronograph counter is at 6, when pressing the 2:00 button, the central second hand with orange end will operate.